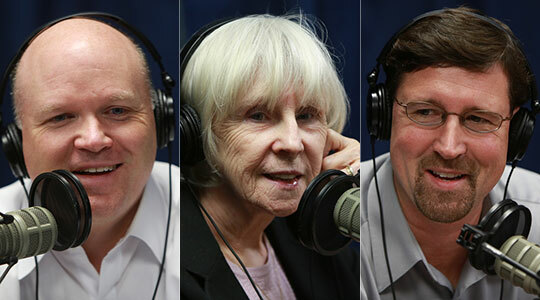 Summary of today’s show: The big news of the week continues to the resignation of Pope Benedict XVI from the See of St. Peter and our Thursday news panel of Scot Landry, Susan Abbott, Fr. Roger Landry, and Gregory Tracy examines the latest headlines and stories from the Vatican, around the world, and here at home to discuss what it means for the Church, why Pope Benedict may have taken this step, how the election of a new pope will take place, and who the cardinals are who will select the next leader of the Catholic Church. 1st segment: Scot Landry welcomed everyone to the show and noted that longtime listeners know we discuss the Catholic news on Thursday and this may be the biggest news we’ve ever had. Susan Abbott said she was in total disbelief when she heard it and compared to hearing when Pope John Paul I died. Gregory Tracy said he was the only one awake in his coffee, getting coffee, and checking his phone for any news alerts. His first thought was that it would be a very busy week. Scot gave a compliment to the Pilot staff for the coverage in this week’s newspaper. Greg said it was important to counter all the speculation in the secular press, especially what they got wrong. He gave credit to Catholic News Service for being a great resource for Catholic newspapers. Scot said the Vatican spokesmen have been clearing up questions. We’ve been hearing the details of the monastery Benedict will move into, that his bishop-secretary, Archbishop Ganswein will move in with Benedict but will continue his work as Prefect of the Papal Household. The Conclave will also start sometime in mid-March. Fr. Roger Landry said the Apostolic constitution said there’s needs to be 15 to 20 days before the Conclave can begin, but that’s because of the need for nine days of mourning and they’re apparently going to enforce that rule. Some presume that the Conclave will go fast and the first Mass of the new pope will be Palm Sunday, but Fr. Roger thinks it will go slow. Unlike the last conclave where so many cardinals came in willing to vote for Ratzinger, now there will be a much wider field. Fr. Roger said we’ve also learned how much the whole Catholic world loves Pope Benedict and we’ve also learned how much the media still looks at the Church as just another political institution instead of looking at her on her own terms. He said this a time for people to stay close to authentic Catholic media sources. Scot said there will be two additional Wednesday audiences, with the last on February 27. He will also meet with all the cardinals on February 28. He wondered if all the cardinals will be able to go on February 28, given their responsibilities at home, the need to be in Rome for the conclave later in March, and then Holy Week following right after. Greg’s guess is that Cardinal Seán will make every effort to go because of his great affection for the Holy Father. Scot said he considered that here is an 85-year-old with this massive job. Fr. Roger wrote about that this week in his column in The Anchor. While many of us have been more than satisfied at the level with which he was continuing to serve the whole Church at 85, it’s clear that he believes that the ministry of the successor of St. Peter requires more and better than he thinks he is physically capable of giving. Out of love for the Church, he humbly became the first pope in 598 years to step down. On a physical level, his conclusion is understandable. Very few octogenarians would have the stamina to fulfill the Pope’s daily schedule of continuous high-level meetings and speeches, not to mention grueling international travel and a liturgical schedule awaiting him during Holy Week that has been known to wipe out priests half his age in settings far smaller. If most pastors would be physically challenged to administer a busy parish in their mid-80s, how much more grueling must it be to preside over a church of one billion people. And, in Pope Benedict, we’re talking about a priest who’s had two strokes, a pacemaker for 20 years, prostate problems and some form of degenerative joint disease. All the same, even at obviously reduced physical capacity, Pope Benedict was still capable of leading the Church with incredible wisdom because of his unbelievably brilliant and totally undiminished mind. In one of several interviews I gave on Monday, the journalist asked what people would say his legacy would be in ten years. I responded that it’s more fitting to ask what his legacy will be in 500 years, because having him on the cathedra of Peter was like having another St. Leo the Great, someone whom future generations will likely deem a doctor the Church. Susan said she didn’t know about the pope’s pacemaker until she read this week that he’d recently had its battery replaced. Scot said part of the big shock is that we’ve always assumed popes serve until they die. Nevertheless, Pope Benedict had said in the past that popes could and sometimes should resign for the good of the Church. Greg said we had no more clear example of service until death than Pope John Paul II, who was under great pressure to resign for years. He said it wasn’t until this modern era that a person living on and on while physically debilitated became possible. He thinks Pope Benedict wanted to set a precedent and make it possible for his successors to take this option. Scot asked Fr. Roger why Pope’s don’t have a retirement age when bishops and pastors do. He said historically even bishops and pastors didn’t have mandatory retirement ages, but in 1983 with the Code of Canon Law that was implemented after cases of bishops and pastors staying in office well after they could no longer carry out the duties of the office. For the Holy Father we kept the old system. There can’t be a mandatory retirement age for the Holy Father because he is the Supreme Legislator and there is no one to enforce a retirement. There are procedures in place in the case of a pope who is non compos mentis to have the election of a new pope. Scot said he’s always wondered what it’s really like in the Sistine Chapel when the conclave happens. Cardinal Seán was asked some of the questions about it earlier this week during a news conference. His answers were consistent with most cardinals who have been asked in that he doesn’t believe himself to be the man who should be selected. Susan related a story with the lesson that none of us are worthy and so we all are equally valid choices in some ways to serve the Lord. She noted that the Cardinal said he had bought a round-trip ticket for Rome and expects to come home. She notes that the room in which the new pope vests for the first time is called the Room of Tears because of the way the men selected react very often. Scot said his sense is that Cardinal Seán knows about 50 of the cardinals, but still needs to do a lot of research to understand the backgrounds and gifts of the other possible candidates can offer. Only then can he stand up and say that “this” is what the Church needs most in the coming decades. Fr. Roger said he expects the cardinals have started praying for guidance of the Holy Spirit and personally calling for God’s help. They’re starting to seek help and learning more about the other cardinals. They’re probably expressing their shock with each other. They’re probably talking the qualities of the next Holy Father vis a vis the challenges facing the Church. He said the 2005 conclave will have been easier than this one and this conclave will be more like 1978. Scot said we will probably end up with 116 voting cardinals. He asked how the balloting works. Fr. Roger talked about the mechanics of the voting, how each one submits a ballot. They need a two thirds majority of ballots. We will not know the results of any balloting until the pope is elected. We will never know who the other candidates were. Scot asked what we should be doing as Catholics as we think about who the next pope will be. Susan said we should all be praying every day for our new pope, especially the Veni Creator Spiritus. Susan and Scot agreed that the criteria listed by Cardinal Seán as the necessary qualities for the next Pope are held by Cardinal Seán himself and many of the other American Cardinals. On the question of whether we should speculate or have favorites, Greg said we can’t help but do that. Especially since Pope Benedict has not died, so there’s no sense that it’s all morbid and too soon. He said our hopes for who the next Pope should be or what he is to be need to be tempered so we can be open to who the Holy Spirit selects. Fr. Roger said we should have as intelligent a conversation at our level as the cardinals will be doing. They will not engage in tokenism, asking for someone who fits some broad description. Instead they will choose the man. Pope Benedict has long called conscience an “organ of sensitivity” to the voice of God indicating to us what to do or avoid. While the judgments of conscience can always be erroneous, Pope Benedict has been tuning his “organ” for so long and fighting against false ideas of conscience that it is highly unlikely that he would be hearing the Lord say “go” when the Lord was in fact stressing “continue on.” So his decision to resign does not seem to be the “no” of someone who wants to quit the burdens of the papacy but one more “yes” in a lifetime of faithful fiats to what the Lord has asked of him. Next, by his decision Pope Benedict gave us perhaps his most powerful lesson about the importance of prayer. He finished his statement mentioning that he would “devotedly serve the Holy Church of God in the future through a life dedicated to prayer,” carried out in a monastery on Vatican grounds. Throughout his papacy in his catecheses on prayer over the last two years as well as in many talks to priests, seminarians, religious and faithful, he has repeatedly stated that the most important thing we do as Christians for God and others is to pray. By resigning the papacy in order to continue to serve the Church devotedly through prayer is to declare that he believes the work of prayer is even more important than the ministry of the papacy. And if prayer is even more important than the work of the successor of St. Peter, then it’s hard to argue that any other ministry in the Church – or any other human work – is more important than prayer either. There’s probably been no greater illustration of the lesson Jesus taught Martha and Mary in Bethany than this. It was said that perhaps John Paul ll’s greatest teaching of all was his proclamation of the Gospel of redemptive suffering over the last years of his life. I anticipate that the primacy of prayer – which means the primacy of God’s action in us – may become the lasting lesson of the final years God grants Pope Benedict. The last item about his statement that stuck out to me was his reminder to all of us that the “Supreme Pastor” of the Church is Christ, not his earthly vicar. While Popes may come and go, the Good Shepherd will never have an interregnum. For Pope Benedict, in his preaching, in his celebration of the sacraments, and in his bearing, he was always focused on Jesus, not on himself. At World Youth Days, for example, he intentionally took the focus off of the Pope and had millions of young people drop to their knees with him in humble adoration of the Lord in the Eucharist. Scot asked Greg how they will cover the Conclave. He said it’s completely uncharted territory and they don’t know yet. They also don’t know how they will cover and deal with Pope Benedict’s continuing life after the papacy. It’s all uncharted territory.